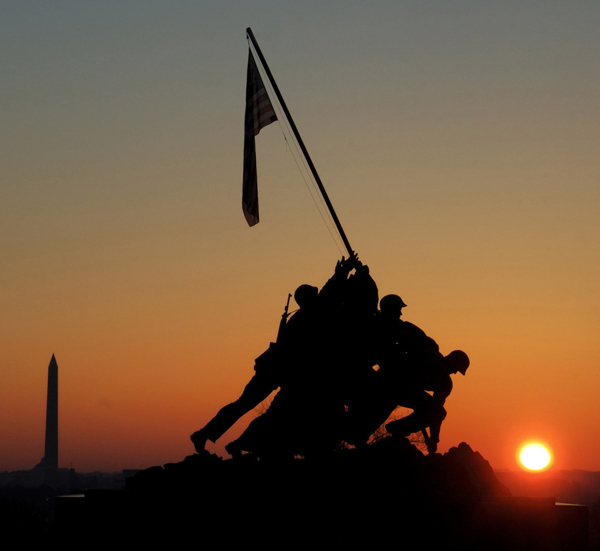 The Marine Corps War Memorial, also known as the Iwo Jima Memorial, honors the Marines who have died defending the United States since 1775. The Marine Corps War Memorial is located near Arlington National Cemetery, in Arlington, Virginia, just across the Potomac River from Washington, DC. The design of the massive sculpture by Felix de Weldon was based on the iconic photo Raising the Flag on Iwo Jima, taken during the Battle of Iwo Jima by Associated Press photographer Joe Rosenthal. 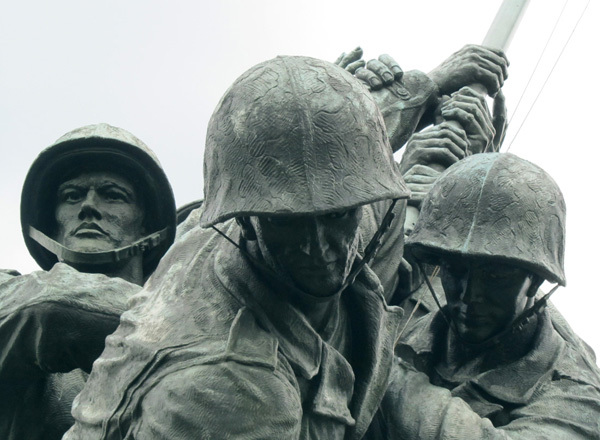 The memorial features five Marines and a Navy corpsman of the 5th Marine Division who raised the second flag over Iwo Jima on February 23, 1945; Sgt Michael Strank, Cpl Harlon Block, PFC Franklin Sousley, PFC Rene Gagnon, PFC Ira Hayes and PM2 John Bradley. "In honor and memory of the men of the United States Marine Corps who have given their lives to their country since 10 November 1775"
"Uncommon Valor Was a Common Virtue." 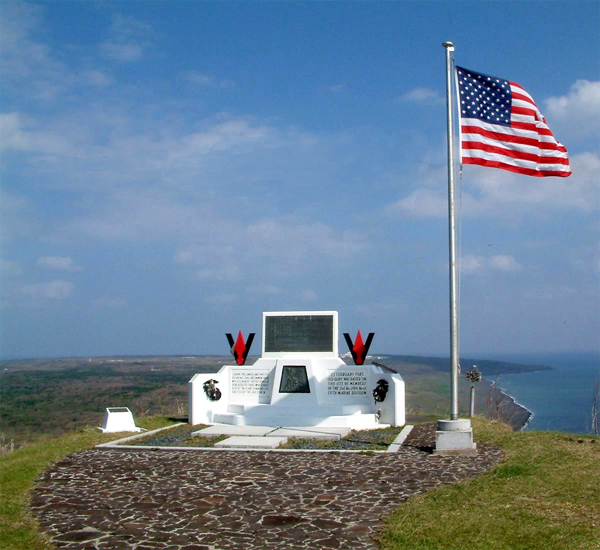 This is a tribute by Admiral Chester Nimitz to the fighting men on Iwo Jima. 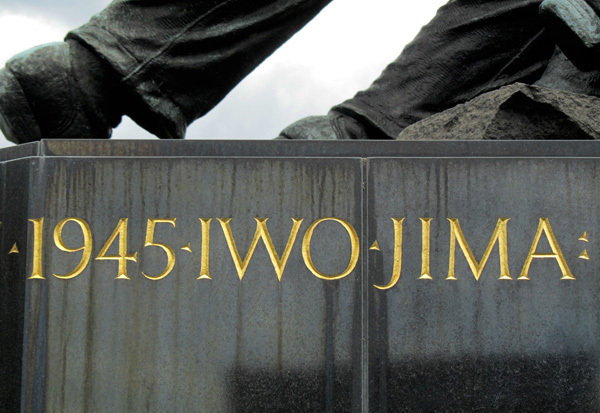 The location and date of every major Marine Corps engagement up to the present are inscribed around the base of the memorial. The base is made entirely in the deep black diabase of Lönsboda, a small town and a quarry in the southernmost province of Sweden. The memorial was officially dedicated by President Dwight D. Eisenhower on November 10, 1954, the 179th anniversary of the Marine Corps. In 1961, President John F. Kennedy issued a proclamation that a Flag of the United States should fly from the memorial 24 hours a day, one of the few official sites where this is required. The Marines of Marine Barracks, Washington, D.C. use the memorial as a centerpiece of the weekly Sunset Parade featuring the Drum and Bugle Corps and by the Silent Drill Platoon. This monument was erected on the actual spot where Sgt Michael Strank, Cpl Harlon Block, PFC Franklin Sousley, PFC Rene Gagnon, PFC Ira Hayes and PM2 John Bradley raised the second American flag on February 23, 1945. It has been hard to find very much information about this monument. I am not sure when it was first built but I found an old AP photo that said the United States flag was flown over this site 24 hours a day until a quiet ceremony on March 17, 1968 when the actual flag was replaced by a bronze image of the flag. The island was due to be returned to Japanese control at that time. Iwo Jima is like Mecca for the United States Marine Corps. Visiting Marines leave personal mementos behind during their 'pilgrimages' to this sacred site. The Eagle, Globe and Anchors on the left and right side of the monument are completely covered in dog tags left by visiting Marines and service men to honor the 6,131 killed on Iwo Jima. 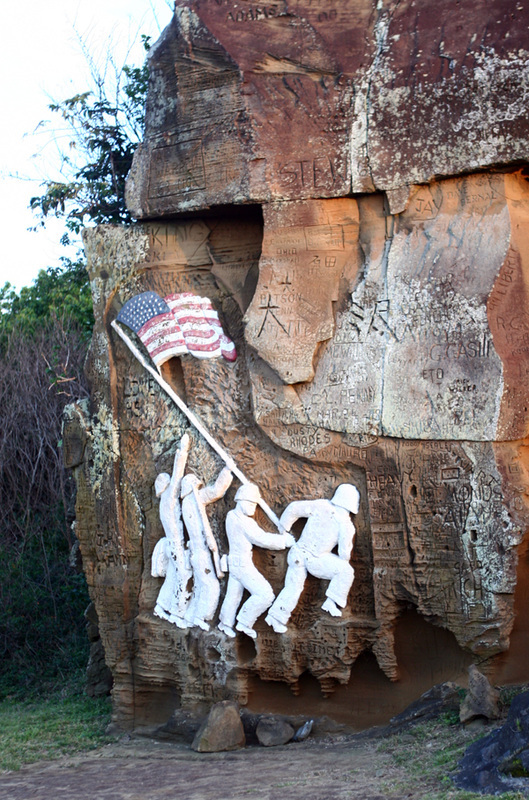 This sculpture of the famous Mount Suribachi flag raising was carved out of a sandstone cliff on the island of Iwo Jima by Waldon T. Rich, a member of the 31st Naval Construction Battalion, in July 1945. 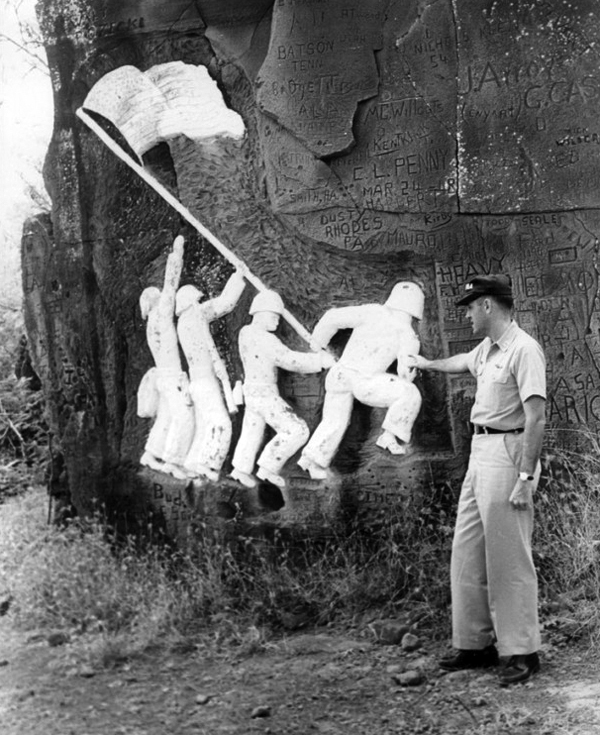 By tradition, military members visiting the monument carve their name in the soft sand stone rock formation. The rock carving was done when Mr. Rich (a Navy Seabee) was stationed on the island. He was there at the time of the invasion according to his daughter, Patricia. She recalls him also mentioning that he saw the famous B-29, the "Enola Gay" fly over the island on it's way to destiny over Hiroshima. Mr. Rich trained as a Navy Seabee with the U. S. Marines in Hawaii before being sent to Iwo Jima. In July of 1945, after receiving a copy of LIFE magazine from his wife which depicted the famous Joe Rosenthal image on the cover, Mr. Rich was inspired to do his rock carving. Like many other service men stationed around the world, he eventually became bored in his after duty spare time. He decided he would use his spare time to work on a carving of the famous flag raising. As the rock carving was progressing, Mr. Rich's superior officer observed his work. The captain was so pleased with the ongoing sculpture that he offered Mr. Rich additional time to work on the carving. Mr. Rich declined the offer in order to maintain his normal work schedule. The location of the rock carving is near what was the U. S. Coast Guard station on the north end of the island. The rock cropping used for Mr. Rich's carving was located directly behind his tent, according to information received from his son, Dale. The carving, for some unstated reason depicts only four men raising the flag. The U.S. Coast Guard was designated the unofficial care takers of the carving for many years. 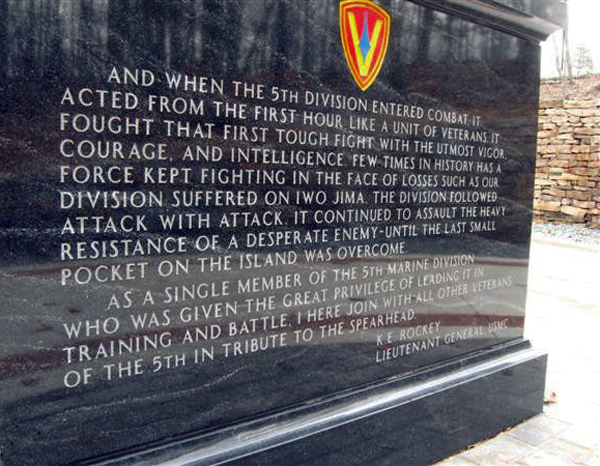 "And when the 5th Division entered combat, it acted from the first hour like a unit of veterans. It fought that first tough fight with the utmost vigor, courage, and intelligence. 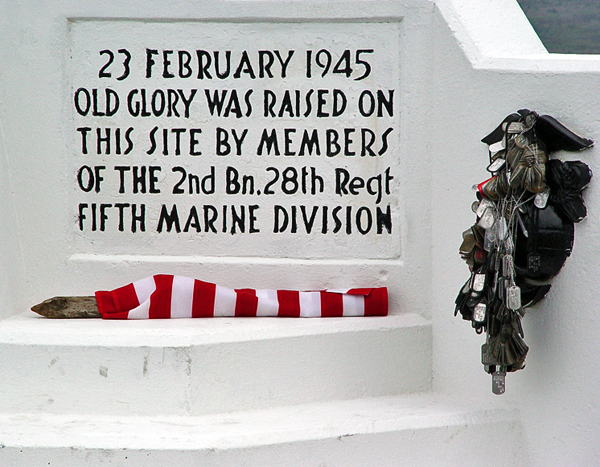 Few times in history has a force kept fighting in the face of losses such as our division suffered on Iwo Jima. The Division followed attack with attack. It continued to assault the heavy resistance of a desperate enemy – until the last small pocket on the island was overcome. As a single member of the 5th Marine Division who was given the great privilege of leading it in training and battle, I here join with all other veterans of the 5th in tribute to the Spearhead." On the back of the base is a plaque with names of contributors. 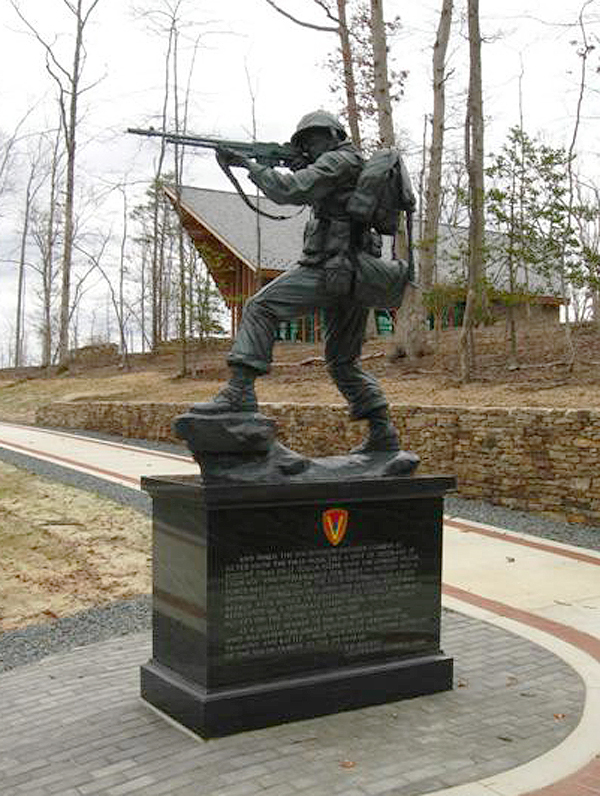 The monument was installed on November 10, 2010 and was officially dedicated on February 18, 2011. 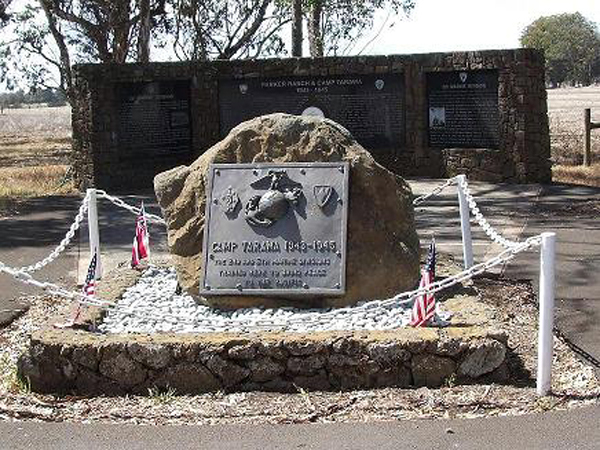 Between 1995 and 1998, the Camp Tarawa Historical Foundation raised the funds necessary to create a large, three-panel rock and granite monument at South Kohala, Hawaii. 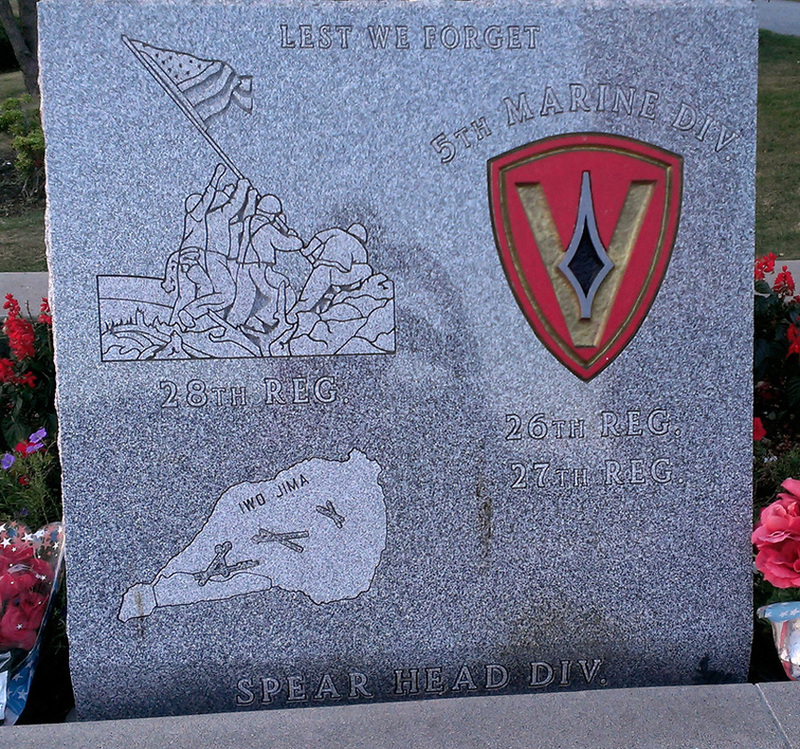 The three panels honor the Second and Fifth Marine Divisions, and the V Amphibious Corps. The dedication ceremony was held on March 29, 1998. Among the attendees were many veterans, three active duty Marine Corps general officers, the Marine Forces Pacific Band, a Marine color guard, and scores of local community leaders and residents. 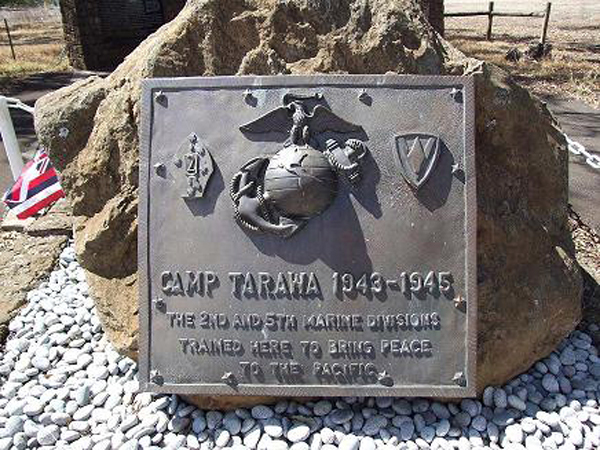 "This stone honors the heroic Marines and Sailors of the 5th Marine Division who trained at Camp Tarawa in preparation for the February 19, 1945 assault on the island of Iwo Jima. They arrived at the camp throughout the summer and fall of 1944. The division conducted rehearsals for the assault using the steep volcanic hills located on Parker Ranch which simulated Iwo Jima's most significant military feature, Mt. Suribachi. 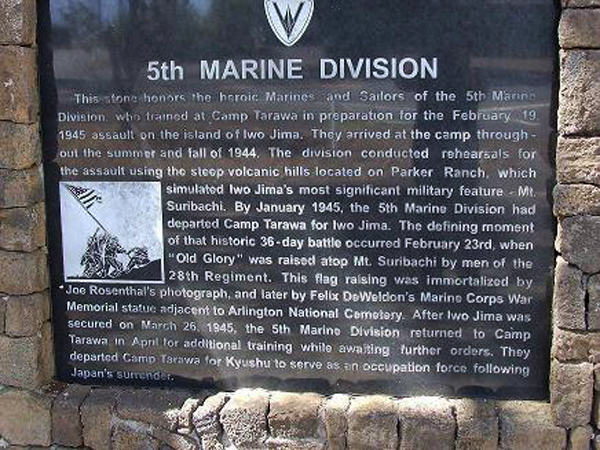 By January 1945, the 5th Marine Division had departed Camp Tarawa for Iwo Jima. The defining moment of that historic 36-day battle occurred February 23rd when "Old Glory" was raised atop Mt. Suribachi by men of the 28th Regiment. 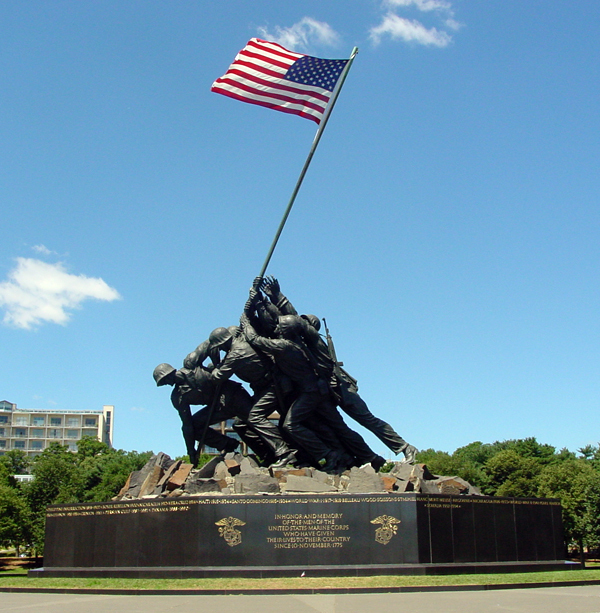 This flag raising was immortalized by Joe Rosenthal's photograph, and later by Felix DeWeldon's Marine Corps War Memorial statue adjacent to Arlington National Cemetery. After Iwo Jima was secured on March 26, 1945, the 5th Marine Division returned to Camp Tarawa in April for additional training while awaiting further orders. They departed Camp Tarawa for Kyushu to serve as an occupation force following Japan's surrender." 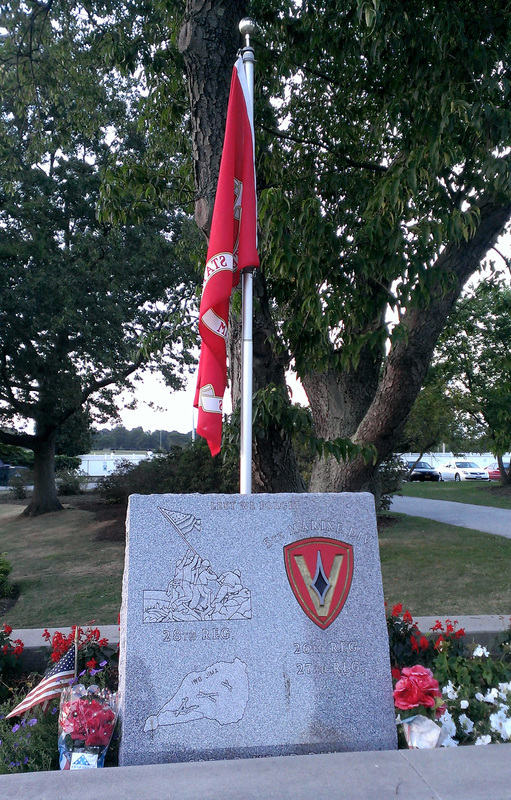 This 5th Marine Division monument is located in Eisenhower Park Veterans Plaza in East Meadow, New York. 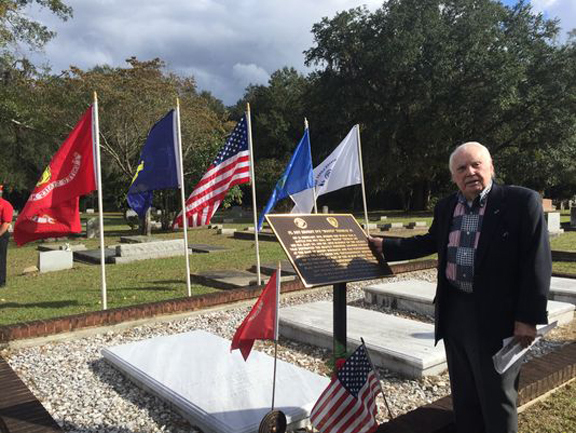 Angelo Ciotta 3/28, an Iwo Jima veteran and Purple Heart recipient, paid for the monument. He is in charge of the plaza, which has several monuments and statues dedicated to various military organizations. On July 4, 1993 a special 25th Anniversary Reunion of the Siege of Khe Sanh was held in Washington D.C. attended by more than 200 Khe Sanh Veterans. 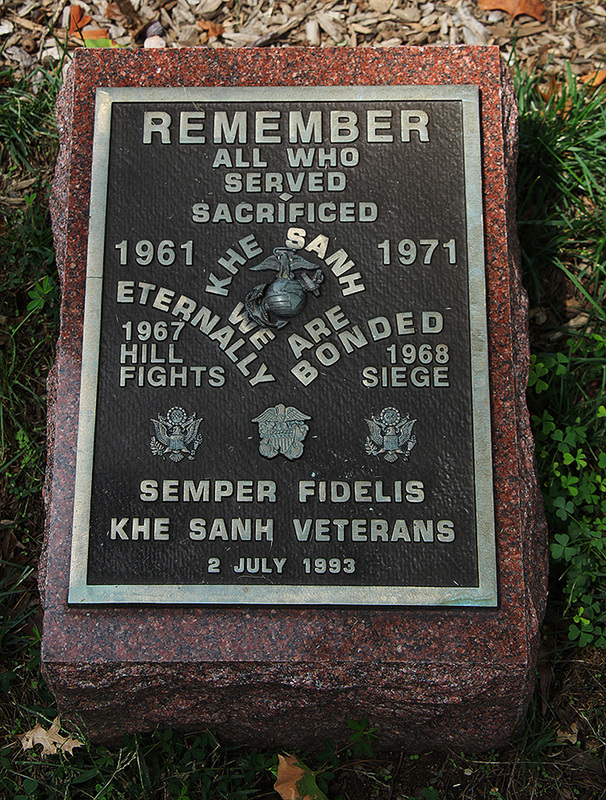 A memorial bronze plaque to remember all who served at Khe Sanh was dedicated at Section 2 of Arlington National Cemetery. 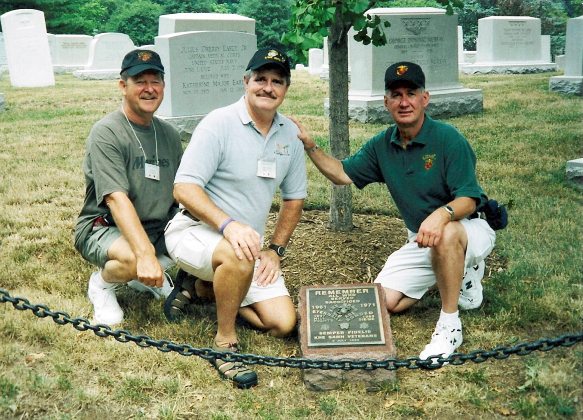 The concept of a Memorial was the brainchild of Ken Penn (W 1/13). A Ginkgo tree, a symbol of remembrance, tenacity, & survival despite adversity, was suggested by Ray Stubbe and was planted with a handful of Khe Sanh Red Clay soil as part of the Memorial site. General Carl E. Mundy Jr., then Commandant of the Marine Corps and Khe Sanh Veteran, S-3, 3rd Battalion, 26th Marine Regiment, officiated at the dedication. The photo below is a group of Khe Sanh veterans at the memorial in 2007. I do not know these gentlemen's names. After the war, the John Basilone American Legion Post decided to build a memorial to honor John Basilone. At first, there was talk of naming a library after John. Soon it was agreed that a statue would be a useful and lasting tribute. A committee was set up to raise the money necessary. Through a nationwide appeal, the money was raised. To build the statue, they chose a sculptor, Philip Orlando, who had been a boyhood friend of John’s. Orlando understood what it was like to be a soldier having served in World War II. He saw the horrors of combat up close himself, earning a Bronze Star while serving in France, Belgium, and Germany. It was decided that the statue would be life size, mounted on a four foot granite pedestal. Orlando used photographs and his own recollections of John to design it. The statue is representative of John Basilone at Guadalcanal on the night he earned the Medal of Honor. John is stripped to the waist and is holding the Browning machine gun that he used that night. Over his shoulder is a cartridge belt of ammunition, just like the ones he had carried through the jungle in the darkness while braving enemy fire. Around his neck is a crucifix and his dog tags. John’s parents came to the studio to see the work in progress, and gave it their endorsement. Initially, the location for the statue was going to be across the street from his parent’s house on First Avenue. But the final location settled on was the corner of Somerset Street and Canal Street. Upon the completion of the statue, the town scheduled a grand ceremony. On June 6th, 1948, there was a large parade through town. The estimated attendance was 15,000. After the parade, the attendees gathered around the covered statue. To start the program, the Camp Kilmer band played The National Anthem. Then, the Basilone Statue was unveiled by John’s mother Dora as the band played The Marines Hymn. John’s brother George, also a Marine, stood with his mother as an honor guard. Father Amedeo Russo then blessed the statue. The St. Ann’s choir sung Ava Maria. Then Catherine Mastice sang Manila John, just as she had done before on John Basilone Day on September 19th, 1943. Henry O. Hansen Memorial Park is located in Somerville, Massachusetts at Medford Street and Partridge Avenue. On February 23, 1945, six servicemen raised the U.S. flag at Iwo Jima and the photo capturing that moment has become an icon of WWII history. But a first flag was raised earlier in the day by six others. Leading their charge under gunfire was Marine Sgt. Henry O. Hansen, Somerville High School class of '38, who enlisted at age 18. He died in battle, just seven days after raising that flag. Dedicated on June 1, 2004, this neatly landscaped memorial park was dedicated to his memory. The park features a few benches and a number of commemorative plaques which provide information on Hansen, including his birth certificate and some World War II photos. The park is open daily. 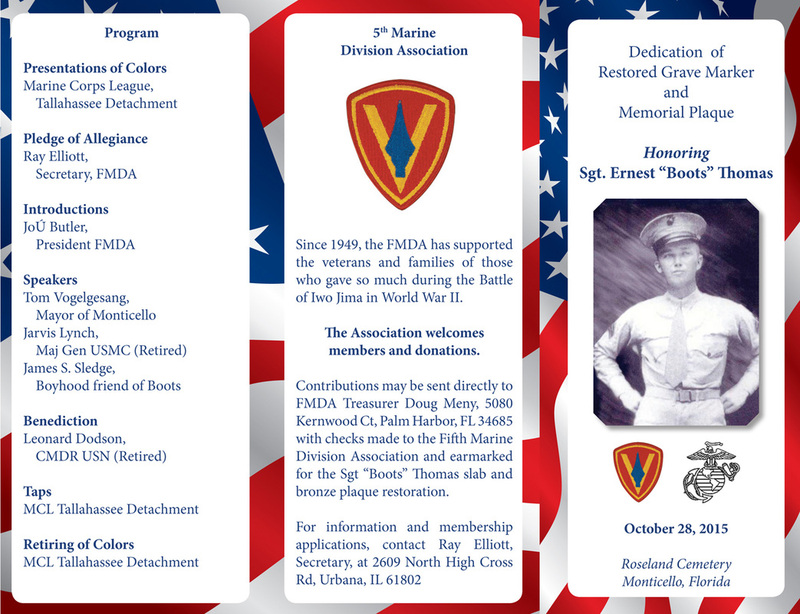 2015The Ernest Ivy "Boots" Thomas gravesite and Memorial Plaque are located in Monticello, Florida at Rosalind Cemetery. 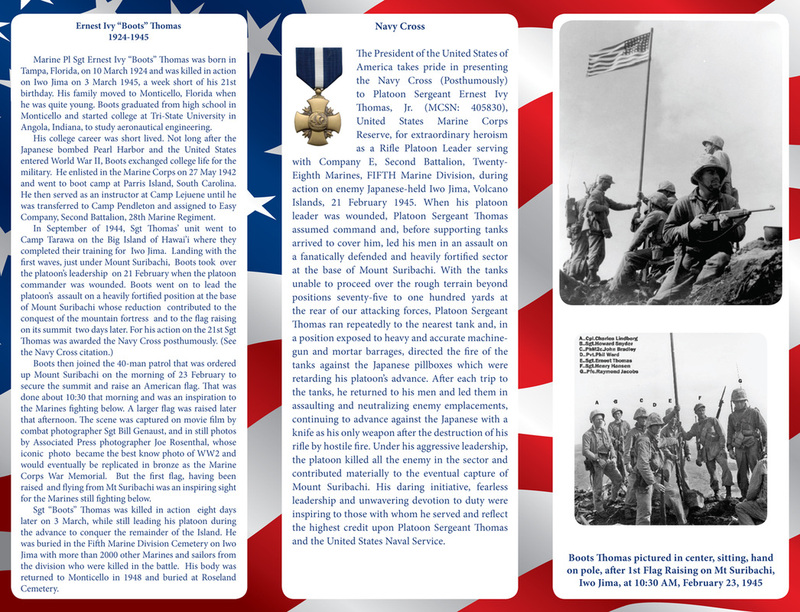 Boots Thomas cemented his place among the ranks of U.S. Marine Corps heroes by his actions on Iwo Jima. He helped raise the first flag over Mt. Suribachi on February 23, 1945. 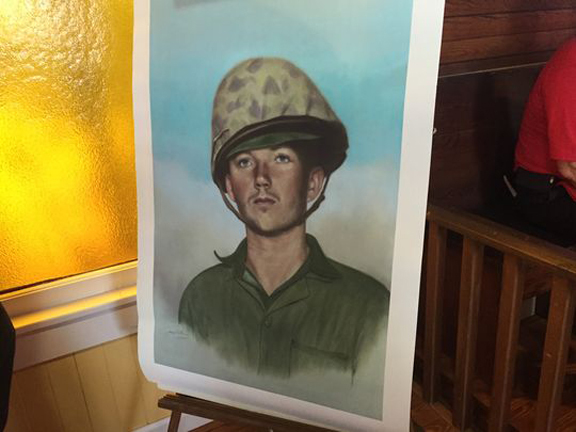 He was killed in combat eight days later, only a week before he was to turn 21. He was initially buried in the 5th Marine Division Cemetery on Iwo Jima, but his body was moved to Roseland Cemetery in Monticello in 1948. 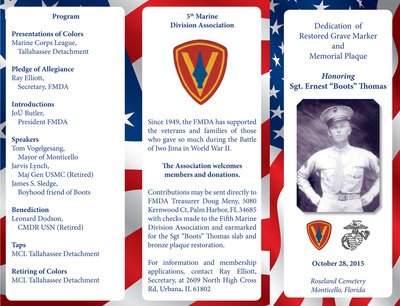 ​Please click on the flyer from the dedication ceremony.